Today I had the opportunity to hear from Rumi Morales, a pioneer in identifying, investing and cultivating the emerging technologies that will define our economy’s next generation. An early specialist in digital currency, blockchain and distributed ledger technologies, Rumi is also a leading early investor in artificial intelligence, deep learning, predictive analytics, and quantum computing as they will affect traditional industries. In her previous role at CME Ventures, the investment arm of the Chicago-based CME Group, Morales was responsible for early investments in blockchain startup Ripple, distributed ledger startup Digital Asset Holdings, and payment provider Dwolla. More broadly, Morales spearheaded investments in blockchain companies as well as in companies specializing in artificial intelligence, IoT, and quantum computing. “The team at Outlier spotted the convergence of distributed ledger technology, IoT and AI very early and we couldn’t be closer in our thinking on where value is being created for the economy of tomorrow,” Morales said in a statement. 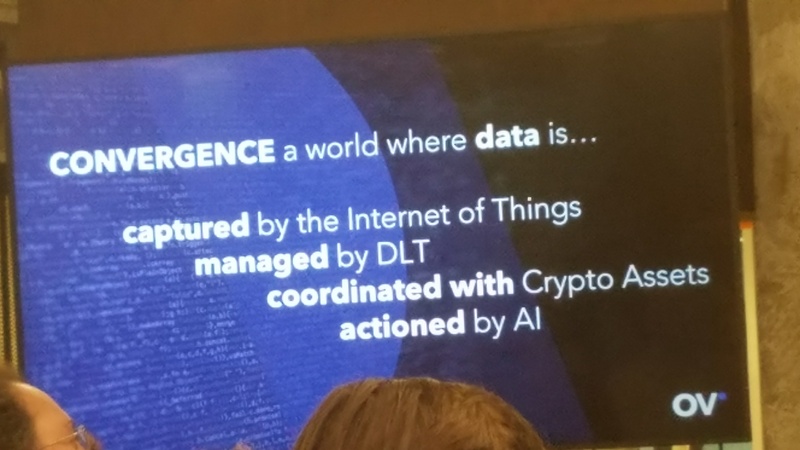 The session today covered Outlier’s thesis on the markets of the future in a world where data is captured by the Internet of Things, managed by blockchains, and automated by artificial intelligence. As these technologies converge, they discussed the risks, rewards, challenges and opportunities in this new economic paradigm. That description of a world where “data is captured by the Internet of Things, managed by blockchains, and automated by artificial intelligence” makes me kind of go weak in the knees in anticipation. The future is going to be a very interesting place I think, mainly due the convergence of these technologies you mention. It’s a cool time to be alive for those of us who play in this space.